Smriti Irani spoke back-to-back at rallies in South 24 Paraganas and Nadia district in West Bengal. Union minister Smriti Irani said on Thursday that the Centre had given more funds to West Bengal than the previous Congress regime. 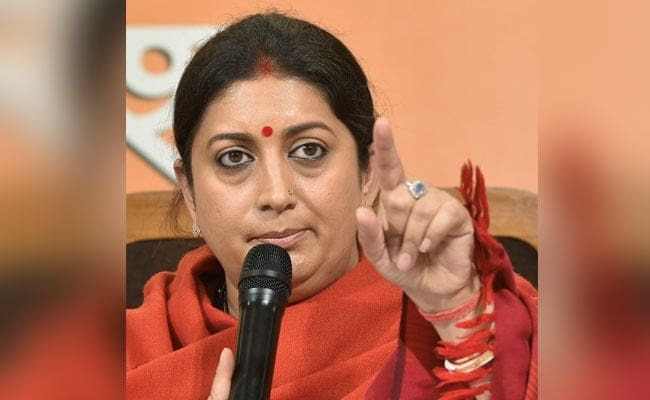 Speaking at back-to-back rallies in South 24 Paraganas and Nadia district in West Bengal Smriti Irani said the UPA government gave Rs 1 lakh crore to the state, while the PM Modi's government allotted Rs 2.8 lakh crore to the state. "Didi (Mamata Banerjee), why do you dislike the prime minister an alliance with the Congress and other opposition parties," she asked. "Ask Mamata Banerjee why she is averse to Ayushman Bharat health scheme, under which poor people can avail healthcare facilities," she said. Stating that 2.26 lakh people in the state have benefitted from the Jan Dhan Yojana apart from other Central schemes, Ms Irani slammed Mamata Banerjee for being "most ungrateful" to the Centre. "Ar ekbar Modi sarkar (Modi government once again)," she said. At Krishnagar, Ms Irani said that the people of Bengal are compelled to pay the ''tolabaji tax'' (extortion money) from "birth to death". "If you ask the poor people in Bengal what the TMC has given to them they will reply that it has not given but taken ''tolabaji tax''," she said. BJP state president Dilip Ghosh and senior leaders Mukul Roy and Rahul Sinha were present at the rallies.